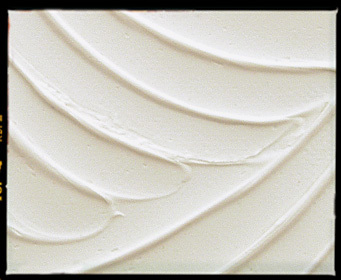 A matte, opaque preparation of marble dust and polymer emulsion. Dries more slowly than other modeling pastes to a hard, yet flexible surface. Use to build heavy textures and three-dimensional forms. Recommended for use on supports with occasional flexing. 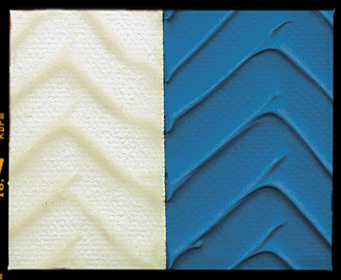 Dries more slowly than other modelling pastes to a hard yet flexible surface. Used to build three-dimensional forms and heavy textures on supports that may be subject to flexing or movement. When mixed with acrylic colours will act as a weak tinting white, while increasing thickness and rigidity. Excellent substrate for acrylic paint, oil paint, oil pastel, oil bars, watercolour, graphite or dry pastel. 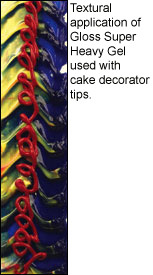 Apply with palette knife, trowel, paint brush, cake decorating tips, etc. Different tools produce different effects. Mix with acrylic colours to produce a coloured tinted paste. 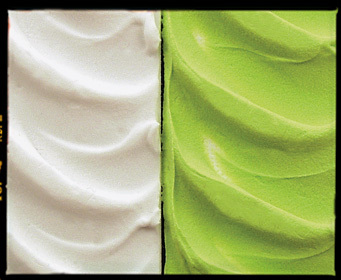 When dry, Acrylic Modelling Paste may be painted with acrylic or oil colours. Excellent for retaining brush marks while slowing the drying time and adding body to the paint. 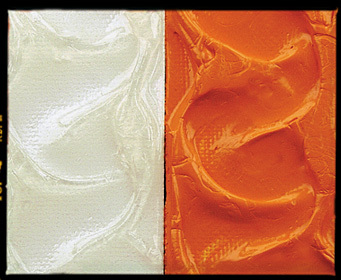 Mix with transparent colours for impasto glazes of great depth and brilliance. Excellent for transferring printed images. Viscosity and body similar to Heavy Body Artist Colour. Translucent when wet, transparent (clear) to translucent when dry. Thicker applications result in less transparent dry medium films. Ideal medium to mix with Heavy Body Acrylic Colour to extend paint, increase the brilliance and transparency of colour, without changing the thickness of the paint. Mix with Heavy Body Artist Colour to obtain paint similar in colour depth to oil paint. Refer to Techniques: Acrylic Sheets, Collage, Glazing, Transferring Printed Images, Silk-screen, Brushwork. Mix with Heavy Body Artist Colour to extend volume and increase transparency, while maintaining paint viscosity. Mix with Soft Body Artist Colour to extend volume and increase transparency, while increasing paint viscosity. When applying Gloss Gel Medium to raw canvas, use adequate pressure to force the medium into the canvas weave to insure proper bonding between the gel and canvas. Makes and excellent glue for collage and decoupage. Use as the binder for powdered pigments to make an inexpensive "student grade" Heavy Body (thick) gloss paint or achieve unusual paint films. Pigment must be compatible with acrylic emulsion. A very thick gel medium that extends working time and increases brilliance and transparency. Mix with acrylic paint to increase body and attain oil paint like consistency that holds brush or palette knife marks. Extra heavy body medium of great density which dries to a transparent or translucent gloss finish. Mix with acrylic paint to increase body, density, viscosity and attain oil paint like consistency with brush or palette knife marks. Keeps paint workable longer than other gel mediums. Refer to the following Applications & Techniques Sections: Acrylic Sheets, Collage, Glazing, Transferring Printed Images, Silk-screen, Brushwork. Mix with Soft Body Artist Colour and Heavy Body Artist Colour to extend volume, increase transparency and increase colour viscosity. Use as the binder for powdered pigments to make an inexpensive "student grade" extra-heavy viscosity (thick) gloss paint. Pigments must be compatible with acrylic emulsion. A super thick gel with high surface drag used to create a stiff 'oil like' feel. Ideal for creating high peaks and sculptural applications that hold shape when dry, with minimal shrinkage. This medium keeps paint workable longer than most other gel mediums. Mix with Soft Body Artist Colour or Heavy Body Professional Artist Colour to increase colour viscosity, body, extend volume, increase transparency and colour brilliance. Creating a sculptural ground, be sure to use adequate pressure to force the gel into the raw canvas to insure proper bonding. Apply paint over the gel after the gel is dry. Be careful not to include so many foreign materials as to jeopardize the strength of the paint film. Be sure they are compatible with acrylic emulsion. A lightweight and airy preparation of marble dust and polymer emulsion specifically formulated to be used in applications where weight is a factor. Can be used to add body to paint and create pastel tints. Dries to a matte opaque white and can be mixed with acrylic colour or over painted. Recommended for use on rigid supports to avoid cracking. A lightweight, airy, flexible, thick, sculptural gel specifically formulated to be used in thick applications where weight is a factor. Will not exhibit "mud cracking". Used alone, will dry to a matte opaque white that readily accepts staining if desired. Mix acrylic paint into Light Modeling Paste or let dry and paint on top. Same qualities as Gloss Gel Medium, except dries translucent with a satin/matte finish. Matte Gel Medium has greater adhesion than Gloss Gel Medium and Gloss Heavy Gel Medium. Colour mix will dry to a satin sheen. Refer to Techniques: Collage, Glazing, Brushwork. Mix with Heavy Body Artist Colour to extend volume and increase translucency, while maintaining paint viscosity. Mix with Soft Body Artist Colour to extend volume and increase translucency, while increasing paint viscosity. Recommended as a translucent ground (size), for acrylic paint with excellent tooth and adhesion, instead of gesso. Will allow some colour and texture of the support to show through. Use as a substitute size for the hide glue size traditionally used for oil paintings. To prevent Substrate Induced Discolouration (SID), wash cotton or linen canvas before use. Exterior Murals: If the support or wall is very rough, a coat of Matte Gel Medium should be brushed or troweled onto the surface prior to gesso application. Refer to Gloss Gel Medium: Techniques - Ground for more detailed information. 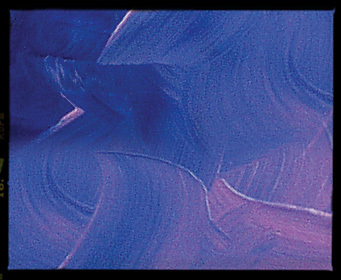 Mix with Liquitex Heavy Body Acrylic Colour for impasto effects that dry to a matte sheen. Use as the binder for powdered pigments to make an inexpensive "student grade" Heavy Body (thick) matte paint. Pigment must be compatible with acrylic emulsion. A very thick, matte, opaque preparation of marble dust and polymer emulsion used to build heavy textures on rigid surfaces. This product handles like clay and dries to a very hard stone-like surface. Can be mixed with acrylic colour or over-painted when dry. Makes an excellent substrate for acrylic paint, oil paint, oil pastel, oil bars, watercolour, graphite or dry pastel. Great for sculptural applications and may be sanded, carved, or drilled when dry. For use on rigid supports. 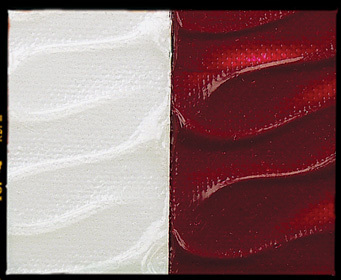 When dry, Acrylic Modeling Paste may be painted with acrylic or oil colours. 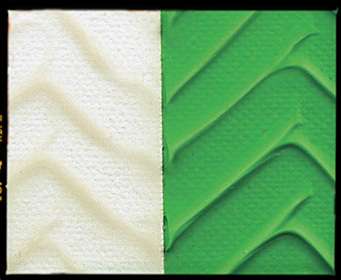 Absorbent ground: Mix 1 part Acrylic Modeling Paste with 3 parts Liquitex® Acrylic Gesso. Apply with trowel or roller. Let dry, then sand smooth. Repeat if necessary. A heavy body gel used to extend the 'open' time of acrylics by more than 40% for easier blending. Add up to 50% without jeopardising the strength of the paint film to achieve excellent impasto techniques. Is similar in body to Heavy Body Professional Artist Colour. Mix any amount into colour to enhance the depth of colour intensity, increase transparency, gloss, and add flexibility and adhesion to paint film. Formula is designed for use in techniques where slower drying characteristics are desired. 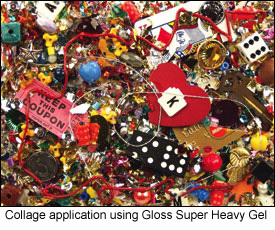 May also be used in many of the conventional techniques for a Gloss Gel Medium such as: brushwork, thick glazes, collage, and murals. A translucent white gel of high density and high solids, that economically extends the volume of Heavy Body Artist Colour without changing its heavy body. Add up to 50% by volume, to double amount of paint and retain colour position. If more than 50% is added, it acts as a very weak tinting white. Maintains the opacity of the colour better than using a clear gel medium. Dries to a matte finish, giving colours a matte sheen and gouache look. Use when running out of a mixed Heavy Body Artist Colour while painting. When you have reached the halfway point of painting the specific area, determine if you have enough paint to finish. If not, add an equal amount of Ultra Matte Gel to the colour enabling you to finish painting without remixing. The colour and opacity will be unchanged, but the colour may lighten (higher value). Mix into Heavy Body Artist Colour during initial underpainting to double amount of colour.